You must choose your Nation: El Morad or Karus. El Morad is a land of barbarians and humans, while Karus is the realm of Tuareks. You cannot create characters from both Nations on the same server, so choose your side wisely. After choosing a nation you will then come to the character creation area. Clicking on “Create Character” will let you make a new character to explore the lands of MAXKO. The next thing you will have to do is pick a class. 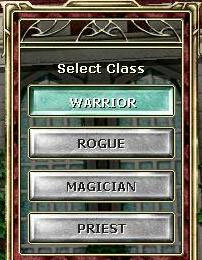 Adventurers in MAXKO choose between these exciting classes. 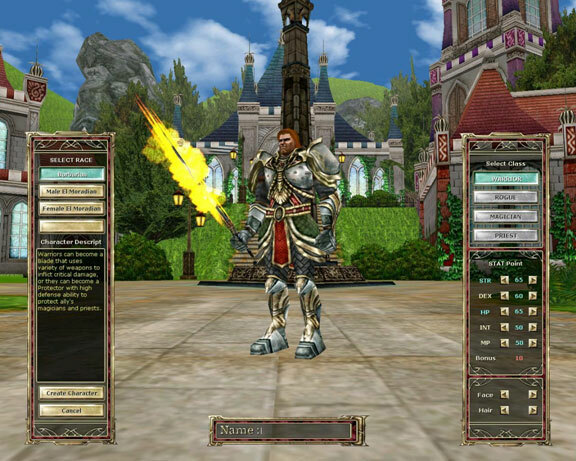 Each of the 4 classes branches into new classes at level 10 and level 60. Depending on your skill tree choice, each class will play differently! STR: Strength determines physical attack/defense ability. DEX: Dexterity affects dodging ability and ranged attack power. 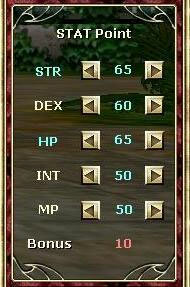 HP: Health points measure a character's life force and ability to withstand damage. INT: Intelligence affects the magic points available to a magician or priest. MP: Magic power affects the damage a character's magical spells inflict. You may purchase stat point redistributions from Grand Merchant Kaishan in Moradon at any time in your knight's career. Click "create character" to complete the process and create your character. You are now ready to enter the world of MAXKO! 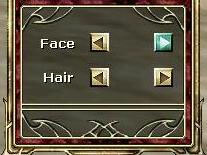 Once you return to the character creation area, click Start to begin playing MAXKO.